This panel explores writing practices across the human sciences, in order to examine how these disciplines produce broader knowledge out of particular chunks of information. In doing so, we aim to expand on recent scholarly enquiry into ordering and explanatory practices across the sciences, including work on case-based science, on narrative forms of knowing, and on collaborative science, by bringing an interdisciplinary perspective to bear on these questions. Our panel not only fosters interdisciplinarity by drawing its case-studies from across the human sciences—French psychology of personality in the 1870s and 1880s, Durkheimian sociology at the fin de siècle, and mid-twentieth-century anthropological work on Bali—but, importantly, each case-study captures a moment of exchange or collaboration between disciplines. They allow us to interrogate the way writing practices from one discipline—as both practical working methods and as textual detail on the page—informed scholarly work in another area, and conversely, what emerging research strands gained from modifying existing conventions. Two broad themes structure our enquiry and provide points of comparison between the three papers: the role of collaboration in human-scientific writing, and the organization of research materials into scholarly publications, both on the broad level of journals and on the fine level of individual articles. Barberis examines how existing models for scholarly journals in the année mode influenced the organization of Durkheim’s Année sociologique, and thus shaped the growing institutionalization of sociology in France. What forms of knowledge were promoted by collaborative working methods in the Durkheim group, or by the pairing of a philosopher and a physician to evaluate cases of amnesia and their psychological import in the late 1870s? Hajek's and Sullivan's papers notably turn on analyses of narrative techniques and the ways they serve to order particular scholarly material—to group “analogous” cases around that of the celebrated Félida X. and thus to claim them for emerging scientific psychology, and to combine written and visual material in Gregory Bateson’s studies of Balinese character. Regarding Bateson, a key question is how the narrative organization of his articles reflects his shift to a cybernetic orientation, and away from psychological theorizing. Each of our case-studies is enmeshed in its particular discursive and institutional context; nonetheless, by bringing them into conversation, this panel traces some concrete ways in which interdisciplinarity (and disciplinary differentiation) are written into the organization and narration of human-scientific knowledge. A Journal as a Moral Community: The Case of the Année sociologique. Analogous Cases in Nineteenth-Century French Psychology: Narrating and Evaluating Double Personality. From Fear to a Steady State: Gregory Bateson’s Narratives of Bali as an Anticipation of the Double-bind. In recent years historians, philosophers and sociologists of biology have, for various reasons, come to take engineering more seriously either as a professional group that interacts with and collaborates with biology, or as offering a distinctive epistemic approach to biological materials and questions. One way in which to push these discussions further, and better integrate them with mainstream histories and philosophies of science, is to consider what cases of biological engineering can teach us about narrative science. Some of the functions narrative has already been found to achieve in other sciences include ordering knowledge, classifying and categorizing it, offering additional tools of representation, and ways of drawing out explanations. Our panel builds on these kinds of foundation. The aim of the workshop was to consider the puzzles and problems of making categories and classes. Our focus was on processes: the activities of making groups by dividing things into classes or giving labels to things so that they fit into classes. To help this focus on doing - on processes rather than outcomes - it was designed to draw on our combined experiential knowledge from a variety of different fields. Science abounds with visual materials: exemplary objects, 3D models, photos, diagrams, maps, graphs. Scholars in the history, philosophy and social studies of science have highlighted various features and roles of these objects and the practices in which they are embedded, including reasoning, speculation, demonstration, illustration, communication, and others. This workshop focussed on the association of visual practices with narratives in knowledge making. In some cases, visual objects embed narrative qualities in themselves; in other cases, narratives are needed to make sense of the visual materials. 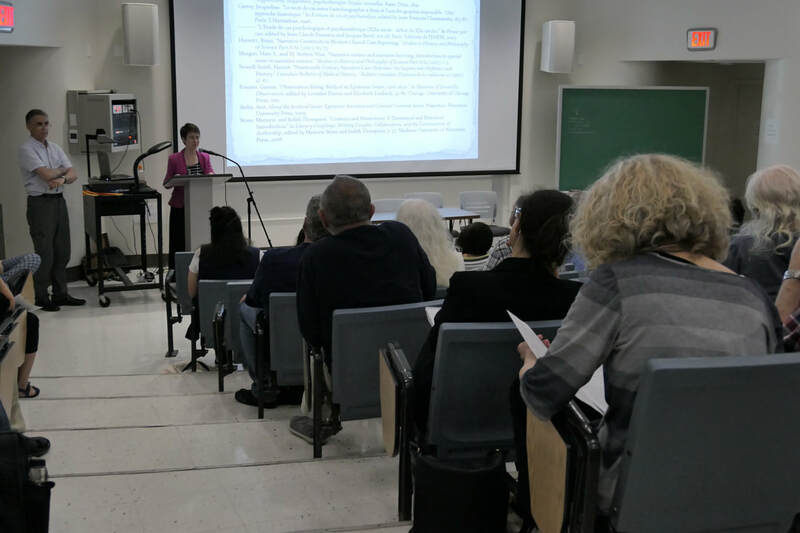 Contributions to the workshop addressed these issues through case studies across a range of disciplines and fields, including archaeology, aerial photography, journalism, geology, phylogenetics, cell biology, developmental biology, and biomedicine. Presentations closely analysed examples of visual materials in various media and the practices in which they are embedded. The discussion evaluated analytic tools that can be mobilized to think about the question raised at the intersection of visual practices and narrative in science. The logos of both UCL and LSE are subject to copyright and are not available for reproduction. 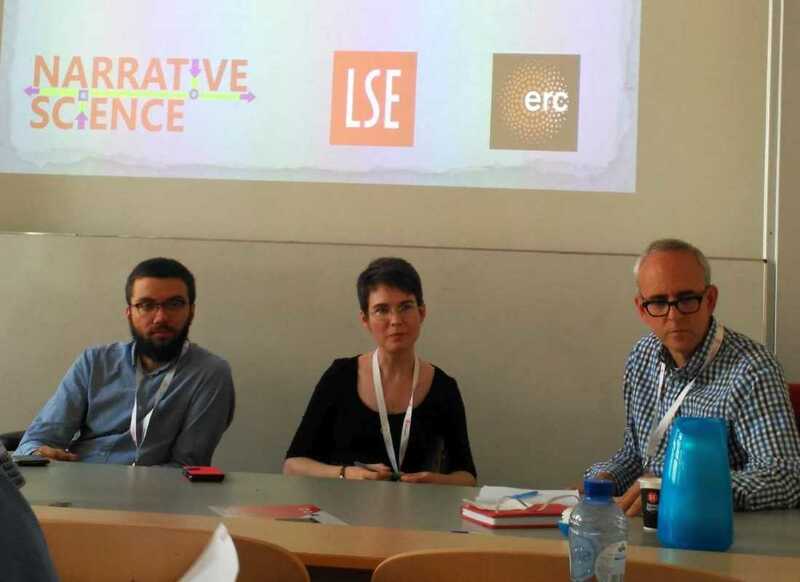 This workshop built on a longstanding collaboration between scholars at UCL and LSE with shared interests in the integration of history and philosophy of science. Every year the department of Science and Technology Studies at UCL and the Centre for the Philosophy of Natural and Social Science at LSE, co-organise a reading group around a dedicated theme. This year we adopted the theme of narrative, and selected readings from the 2017 special issue of Studies in the History and Philosophy of Science on ‘Narrative in Science’, co-edited by Prof. Mary Morgan as part of her Narrative Science ERC funded research project. This workshop consolidates the three earlier sessions (1st, 8th, 15th of May) and gives staff and postgraduate students the opportunity to present short prepared responses to the narrative science thesis, in dedicated discussion panels. 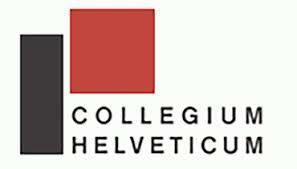 15:00 Chiara Ambrosio (UCL) - Welcome and introduction to panel on narrative and coherence. Panel: Roman Frigg (LSE), Brendan Clarke (UCL), Hernán Bobadilla (University of Vienna), Kim Hajek (LSE). 15:30 Andrew Hopkins (LSE) - Introduction to panel on particulars and generalities. Panel: Claudia Cristalli (UCL), Mike Stuart (LSE), Christian Hennig (LSE), Katherine Jane Cecil (UCL). 16:00 Dominic Berry (LSE) - Introduction to panel on narratives v models. Panel: Kate Vredenburgh (Harvard), Erman Sozudogru (UCL), Robert Meunier (LSE), Mary Morgan (LSE). 16:30 Mat Paskins (LSE) - Response from MSc students. Panel: Sophie Osiecki (UCL), Amelie Peschansk (UCL), Julia Sanchez-Dorado (UCL), Sophie Wang (UCL). 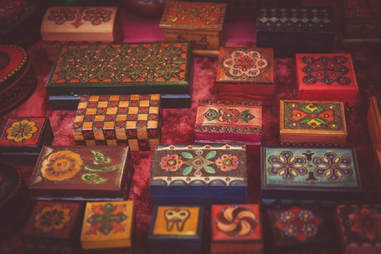 Copyright for this image is retained, and it is therefore not available for reproduction. Within the history of science, scholars are increasingly attending to the epistemic roles played by narrative. Although it is well known that texts in the developing human and social sciences frequently took narrative form—Freud’s comparison of his case histories to short stories is just one prominent example—what is less clear is how exactly narrative functioned to constitute and disseminate scientific knowledge. Notably, to what kinds of knowledge did savants gain access by employing narrative? What textual features allowed narratives to perform explanatory, as well as descriptive, functions? Who narrated human-scientific texts, and what epistemic weight can be given to other voices present in the story? In this panel, we explored narrative knowing in the nascent human/social sciences of Roman Antiquity and of nineteenth-century England and France. 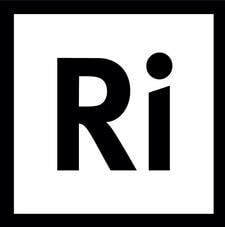 More specifically, we interrogate narrator roles and narrative voices within a set of self-contained texts—exempla, observations, séance reports (all bearing some relation to today’s case histories)—and the ways they inflect understanding of their objects of study. For all the evident diversity in our exemplary narratives, we can nonetheless begin to trace some common strands in the intersection of narrative with human-scientific knowledge. In his exempla, Roman rhetorician Valerius Maximus directly intervenes to guide reader understandings of racial group-membership through the ambiguous connotations of sanguis, while Nancy physician Hippolyte Bernheim similarly takes over the narration of one psychotherapeutic observation to fill in what its original patient-narrator could not, by definition, explain. Yet in the presence of this patient voice, and even more so in the multiplicity of voices—skeptics, witnesses, spirits—found in accounts of automatic writing in the Proceedings of the Society for Psychical Research, we see the collective, polyphonic, often messy means by which narratives advance enquiry in the human/social sciences. Sarah Lawrence (University of New England, Australia) - Exemplary Blood: Valerius Maximus, Model Tales and Hypodescent. Kim M. Hajek (London School of Economics) - Scientific Storytellers in French Psychological and Psychotherapeutic Observations c.a. 1875–1895. David G. Horn (The Ohio State University) - Writing Spirits: Polyvocality and the Social Production of Psychical Research. Our thanks to Prof. Sabina Leonelli for the use of this image, which she took at SPSP. Scientists’ accounts of their fields contain many narrative elements which can be found in various forms, both visual and linguistic, in scientific texts of all kinds. There are narratives about the subject matter of research as well as narratives about the research process, both of which can come neatly separated or be deeply intertwined; there are narratives about small facts and narratives concerning the big picture; finally, there are narratives that appear in published articles and narratives that figure in communication within smaller or larger, interdisciplinary groups of scientists. Such narratives reflect the material practices of the sciences in which they occur and constitute representational practices in themselves. For this reason, a focus on narratives can elucidate many topics pertinent to the philosophy of science in practice, from questions regarding the way experimental practice enters the discursive space, to issues concerning the integration of data from various research fields, to problems of case based reasoning. Is narrative a tool of inference, of explanation, of coherence-making, of prompting discovery? 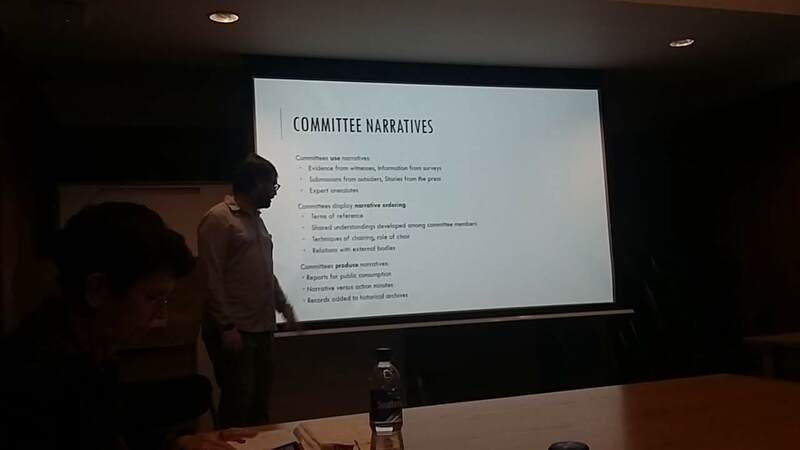 The session addressed and explored such questions about the role of narratives in the sciences, and participants drew on various materials from the history and current developments in chemistry, embryology, biological engineering and anthropology. The individual contributions built on and expand recent work on narratives. It has been argued that narratives are not limited to certain areas (e.g. history or historical sciences such as evolutionary biology), nor can their functions be reduced to ones of rhetoric nor the communication of scientific findings to broader audiences. Instead, they have epistemic and ontological functions associated with representation and explanation in many fields of the natural and social sciences (e.g. Morgan and Wise, 2017). While those studies have begun to develop an account of narratives in science, there are many so-far unasked questions about their roles. In this, our session contributes to a growing strand in the history of science which examines narrative as a form of knowing within the modern sciences. Articles in a recent issue of SHPS considered narrative for its role in creating coherence or helping resolve complex scientific problems. We extend this approach to the discipline of scientific psychology across contexts from the subject-focused observations and experiments of late nineteenth-century France and Italy, to the internationalised discipline promoted by twentieth century American textbooks. For if narrative is readily identified in psychological texts—much more so than in some natural sciences, for instance—its presence often sits uneasily with psychologists’ conceptions and defence of their work as science. Hence the surprising effect of Grasset’s play on novelistic style in his case history. Uneasiness with narrative is particularly evident in late twentieth-century psychology, which tends to dismiss narrative as mere storytelling, a shortcut leading scientists away from best practice. The first paper in our session introduces and historicizes these concerns. By reconstructing intersections between storytelling—in data production and analysis—and textbook depictions of psychology as a discipline, Ivan Flis demonstrates the crucial pedagogical role played by narrative and argues for its fundamental function in advancing the always “unfinished” work of contemporary psychologists. Subsequent presentations take up the epistemological questions raised by contemporary narrative knowing and explore how they might be contrasted productively with practices and writings from the beginnings of psychology. David Horn and Kim Hajek notably interrogate how narrative contributed to making scientific knowledge out of observations and experiments on exceptional subjects. Horn focuses on two women subjects who circulated across national and disciplinary boundaries, Léonie Leboulanger and Eusapia Palladino, while Hajek tracks the multiple retellings of the case of a third: Félida X… and her double personality. Each paper explores the ways in which the stories produced by human scientists worked to channel the extraordinary phenomena displayed by these women—by explaining, by re-explaining, and by explaining away. Ultimately, our presentations begin to map out the ways in which narrative has been deployed in the modern science of psychology and why “narrative knowing” might matter to the discipline. Grasset, J. “Le Roman d’une hystérique: Histoire vraie pouvant servir à l’étude médico-légale de l’hystérie et de l’hypnotisme.” Semaine médicale 10, no. 8 (1890): 57–58. Articles in Morgan, Mary S., and M. Norton Wise, eds. “Narrative science.” Special issue of Studies in History and Philosophy of Science Part A 62 (2017). Neuroskeptic. “The nine circles of scientific hell.” Perspectives on Psychological Science 7, no. 6 (2012): 643–44. Zola, Emile. “Le Roman expérimental.”  In Le Roman expérimental, 5th ed., 1–53. Paris: Charpentier, 1881. Photograph courtesy of Emily Herring. Our papers picked out and highlighted the functions of narrative in modern science, taking in a rich range of case studies that aimed to facilitate broad conclusions. Historians and philosophers of science have already dramatically expanded the range of ways in which knowledge making activities can be described, characterised and understood. Ways of knowing, styles of thought, epistemic things - projects such as these have gathered their own communities of scholars with different versions sometimes competing but more often simply highlighting different aspects of scientific life. Our symposium was dedicated to thinking within these kinds of framework, but also cutting across them, by starting with a particular kind of knowing, that of knowing through narrative, and considering how far this may be a unifying or dis-unifying feature either across the practices of science or within these broader frameworks. The work of scientists’ narratives in the history of science has not yet received this kind of dedicated attention. While there are key exceptions, Gillian Beer’s work on narrative in Darwinism and John Forrester’s exploration of case studies in medicine foremost amongst them, the time is ripe for this kind of communal effort (as only just begun in the recent issue of SHPS vol. 62 2017). The questions of whether scientific knowing is distinct from other kinds of knowing; and whether narrative knowing in science is different from such forms in the humanities, or in other communities where expert knowledge is found and used, are important questions and were highly relevant to the conference themes of unity and disunity. Our questions addressed this unity issue by undermining those who would see science as distinct from ‘humanistic’ understanding, and by providing rich grounds for a renewed appreciation of scientific research in all its variety, and so new insights into how we know. The five papers explored the functions of narrative in different countries, sciences, contexts, and periods. Dmitriy Myelnikov focused on phage research in soviet Georgia and how narrative was of use to those trying to discern what phage were and explain their actions. Ageliki Lefkaditou considered the transformative potential of the museum setting in communicating historical and contemporary scientific narratives at the intersection of texts, things, spaces and people. Meira Gold explored the roles of contrasting field narratives and visual tools in early twentieth century British Egyptology. Debjani Bhattacharyya, who unfortunately was unable to attend in person because the UK Home Office failed to issue her with a visa in time, nevertheless had her paper read on her behalf, which attended to the recording of shipwrecks and the making of a new narrative knowledge for the purposes of insurance and imperial power. Lastly Dominic Berry considered time and narrative in historical objects. Il serait banal de dire que les récits, au sens de textes de style proprement narratif, sont extrêmement répandus dans l’histoire des sciences humaines, surtout dans ces domaines de savoir qui se regroupent autour de la psychologie « scientifique » de la fin du XIXe et du début du XXe siècles. Si le savoir psychologique s’est construit en grande partie à partir de récits avec « toutes les allures d’un roman », au point où certains, comme le professeur de médecine Joseph Grasset, se sont amusés à amplifier le caractère romanesque de leurs récits de cas, l’on s’est souvent contenté de voir dans le « narratif » une simple question de style, une « allure » à opposer à la substance « réelle » du savoir scientifique. Grasset rassure ses étudiants, par exemple, quant au sérieux de l’histoire qu’il leur présente, qui appartient « en réalité » à la science, étant « un fait scrupuleusement vrai et scientifiquement analysé » (57). Ce symposium a pour but de déjouer cette opposition présumée en interrogeant en quoi le « narratif » favorise l’activité scientifique en psychologie. 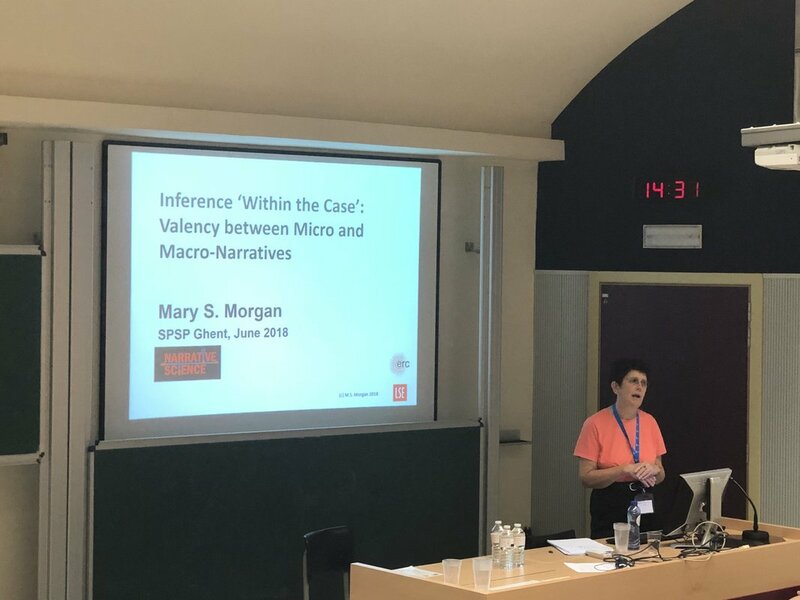 En cela, nous suivons la voie ouverte récemment par Mary Morgan et Norton Wise qui avancent la notion de « narrative knowing », d’un « savoir narratif » distinct qui fait autant partie de l’explication scientifique du monde naturel que l’élaboration de lois mathématiques, par exemple. Selon Morgan et Wise, « the endemic if not chronic use of narrative in science and its regular recurrence speak to the possibilities of what we like to call ‘narrative knowing’: accounts of phenomena that can only be known, or be best known, via narrative » (4). Dans le présent symposium, nous recherchons les fonctions épistémologiques du « narratif » dans des cas célèbres—récits de cas et cas d’illusion visuelle—dans la psychologie naissante. Etant célèbres ou exemplaires, ces cas se sont prêtés à de nombreuses réécritures et reconfigurations ou, alternativement, ils ont permis la retranscription et la diffusion plus large d’« histoires scientifiques » déjà connus. Chaque réécriture ou rediffusion se situe au croisement d’enjeux épistémologiques particuliers et de choix narratifs distincts. Des années 1870 aux débuts du XXe siècle, de divers savants remobilisent les cas de Joséphine Hugues (violée sous magnétisme) ou de Félida X (dont la personnalité serait « dédoublée ») à des fins théoriques et méthodologiques spécifiques. Analyser les aspects narratifs de leurs textes nous permet d’exposer les convergences et divergences éventuelles entre enjeux épistémologiques et modes de narration, voix narratives, valorisation ou suppression de détails, etc. D’autres cas se voient retranscrits d’un mode de représentation à un autre, tels les illusions fondatrices de la psychologie de la perception ; mises en série, ces images suscitent des expériences narratives chez le spectateur que le psychologue doit ensuite articuler avec des descriptions écrites pour produire son propre récit savant de l’illusion. De même, en intégrant la notion de « temps perdu » dans son œuvre, jusque dans son titre, Proust effectue une retranscription éminemment narrative de cette notion physiologique aux frontières de la mémoire et de la perception ; quelles histoires psychologiques cette réécriture romanesque permet-elle de raconter ? De manière générale, analyser la contribution du narratif aux savoirs scientifiques, n’est-ce que repenser les vieilles oppositions entre savoir scientifique et savoir littéraire, entre forme et fond, entre sciences humaines et sciences nomologiques ? Ou est-ce ouvrir sur de nouvelles manières de comprendre le fonctionnement des sciences modernes ? ​If historians of science and technology habitually make and deal in narratives, less often do they consider what narrative is made of, and its roles in knowing and making. The subject of narrative science was the focus of a recent special issue of Studies in History and Philosophy of Science (vol. 62, 2017). Within that special issue authors did note that narrative might have important implications for the kinds of material things that scientists deal with, but it was not clear what roles narrative knowledge might play in sites of technology and engineering, or beyond sites immediately identifiable as scientific. Our panel seeks to address this challenge, drawing the notion of narrative knowledge into the history of technology. Each contributor unpacks how narrative knowing is crucial to their case, not only for the purposes of history making, but for historical actors themselves. This is achieved in a number of ways, either by appreciation of narrative epistemology within a historical site, or through an engagement with scholarship in narratology, literary theory, and philosophy of history, or by showing how narrative structures at the historiographical level have directed and shaped broader historical research patterns. Narrative has the potential to open up the history of technology and central questions at its core. Given the potential breadth of scope, we make the enterprise more manageable by adopting the ‘gateway’ theme of SHOT 2018, focussing on one key gateway, that between histories of science and technology. As with many histories, our case studies refuse to entertain clear distinctions between technical and scientific elements, and so we are able to revisit foundational questions of the relations between science and technology. Rather than merely going back over old tensions, narrative provides a fresh vantage point on these issues and fertile common ground for future integrative work. As an epistemological unit, or as an analytical approach, narrative is not commonly thought of as bound up in materials other than texts, and at the outset, some might be skeptical of the extent to which a notion such as narrative is needed in the history of technology. Our session is innovative because it moves beyond narrative’s role in forms of communication and textual dissemination, to instead investigate its actions and activities in technoscientific practice, in epistemology, and society. In addition, we do not see narrative knowledge as a historiographical competitor with other approaches, or for that matter, as reducible to the historical enterprise itself, in the sense that ‘all histories are stories’. Rather it allows for a potentially productive reconfiguration of technological and scientific epistemologies, on terms that allow us to explore the similarities as well as differences between science, medicine, engineering, and technology. ​Our poster presentation focused on how narrative is at work in many sciences, operating at various levels of reasoning, performing a wide variety of functions. In some areas uses are habitual, as in the natural historical sciences, but they are also to be found in less likely places: for example as integral with mathematical simulations, or in giving accounts of chemical syntheses. Despite their endemic nature, philosophers of science have not yet given much credence to narrative - either as kind of explanation, type of observational reporting, format of representation, or any of the other purposes to which they can be put. Yet - as is evident in the brief outline below - the usage of narratives carries both ontological implications, and prompts epistemic questions. 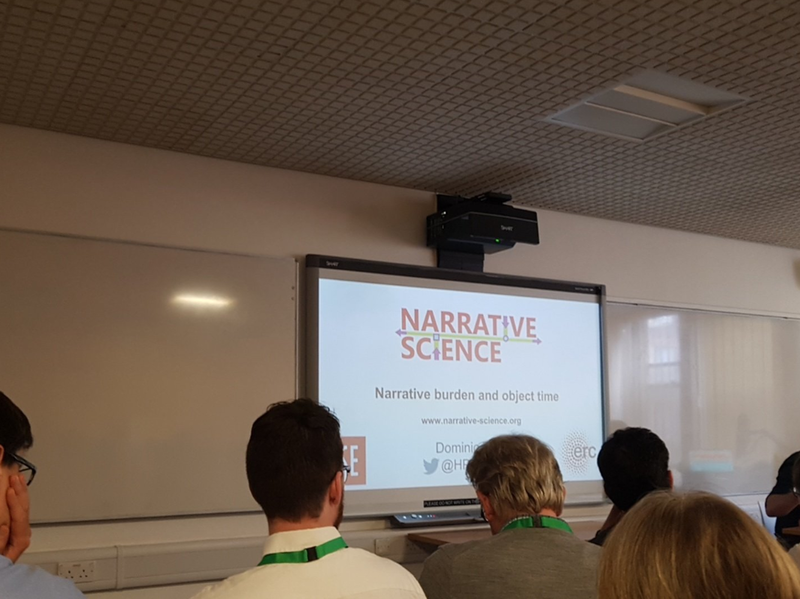 Our poster introduces the ‘narrative science project’, which is investigating a number of scientific sites to develop a philosophical approach to scientists’ use of narratives within their communities, rather than in their pedagogical or popularising usages. Three questions exemplify the value of admitting narrative into the philosophy of science. How do candidate laws of nature interact with narrative explanation in natural historical sciences? Laws are traditionally required for explanation in the sciences, but it has been argued that in the natural historical sciences they rather ‘lurk in the background’. Initial project findings suggest that in narrative accounts in these fields, laws might rather ‘patrol’ than ‘lurk’ - to forbid certain narratives and to constrain those that are told without ever quite determining the account. This ‘patrolling’ may function differently with respect to long-term changes than with short-term upheavals - such as found in geology or earth science. But narratives have also been found in situations of disjunctions or gaps in law-based explanations in these historical sciences, or play a bridging or unlocking function between scientists from different fields working together. How do the social, medical, and human sciences rely on co-produced “analytical narratives” in reporting their observational materials? It is quite typical of a range of scientific methods that ‘observations’ consist of individual accounts of feelings or attitudes or beliefs so that data provided comes direct from the ‘subjects’ involved. Often the materials come in the form of anecdotes, small contained narratives, or fragments of longer ones. Our evidence suggests we should treat these as ‘co-produced’ observations, where sometimes the analytical work goes alongside the subject to be reported polyphonically, and at other times the ‘objective analysis’ of the observing scientist is integrated into the self-witnessed, ‘subject-based’, reporting to produce something like ‘analytical observations’. We should consider narrative seriously as an available format of representation in science, worthy of the same philosophical consideration given to models, diagrams, etc. Answers to these questions will rely not just on philosophy but also narrative theory, which help to distinguish narrative and narrating. Such an approach raises a number of issues, for example: Is there a standard plot, or does it vary with discipline? Our poster imagined the narrative plots of chemical synthesis, developmental biology, anthropology, engineered morphology, psychological testimony, and geological time. All historians of science engage in storytelling. But what about when the science we investigate is itself a science of stories? Examples of narrative abound in natural history, geology, psychology, and in knowledge practices common to many sciences, such as modelling or diagrams. Examining the terrain of HPS from the perspective of ‘narrative’ and ‘non-narrative’ knowledge is a way to read through and between current historiographical approaches, be they institutional, disciplinary, intellectual, or object-centered. 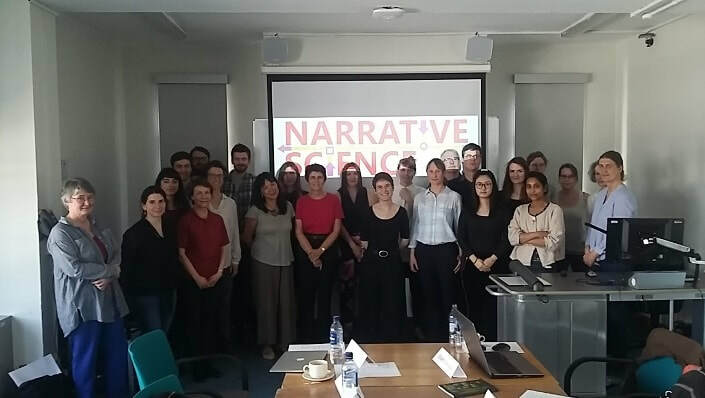 Accordingly, our roundtable canvassed a range of approaches to narrative in HPS to ask how a narrative focus can complement or inflect well-established stories about how science works. Narrative matters because, although it functions in ways comparable to scientific laws and theories, it remains much understudied in the history of science. For instance, to neglect narrative is potentially to miss important ways that scientists join up sets of data or observations, or make use of knowledge from distinct disciplinary domains. A ‘narrative knowing’ perspective also opens up deeper connections between the forms of scientific communication and their content; it thereby offers an exciting opportunity to engage deeply with scholarship in the more literary humanities. The presentations in this roundtable traversed territories from early modern botany, through Darwinism and nineteenth-century French psychology, to engineering biology and contemporary medicine. As a group, together with our audience, we worked through convergences and divergences in how narrative has mattered for science, and where narrative might lead us from here. 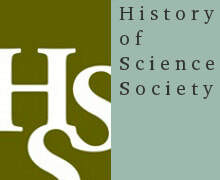 Historians of science have recognised that scientists use narrative in many different fields and different domains - not just in the most obvious domains of the natural historical sciences, or in development stories, but in accounting for reactions, in describing mechanisms, in making sense out of simulations, in piecing together complex social and ecological arrangements, and so forth. Historians have also paid attention to the ways narratives feature in how scientific work is communicated. This symposium investigates how scientists use narrative not just to structure their practices (of hypothesising, observing, and inferring), but in constituting the objects of their science. At this deeper level, we see how scientists’ make use of narrative in the realm of concept formation: that is, in framing, expounding, clarifying, justifying, and then developing, the concepts they create and use. Our research suggests that such narratives of concept formation are broadly as well as deeply based: they may be built upon empirical research problems, developed out of theoretical puzzles, emerge from attempts to make causal sense out of events, or to account for strange phenomena. The individual symposium papers consider the role of narrative in two late 19th century cases: Darwin’s use of narrative in developing the theoretical concepts of evolution and economists’ use of narratives to characterize their competing concepts of utility; and two mid 20th century examples where narratives are involved in developing the concepts of genes in development and the taxonomies of neuroscience. Experts in a wide range of fields routinely construct narratives, especially (though not only) in the aftermath of critical failures. Examples of such narratives include serious case reviews in health care or child protection, inquiries into mechanical failure when a building has collapsed or a plane has crashed, or discussions of how a product has turned out to be unsafe. These narratives often provide the basis for the reform of existing systems and processes, or the construction of new ones: a specific series of events, represented in narrative form, is supposed to provide the basis for patterns of action in the future. At the same time, translation from narrative form into the language of other kinds of expertise can create serious tensions. Narrative forms of expert knowledge raise the question: how do narrative ways of explaining or giving an account of something come up against other ways of knowing things? How do experts construct their narratives? What resources do they draw upon? Could knowledge presented in narrative form be understood without the use of narrative? Are narratives produced more in situations of failure than when things are working well? Are there expert narratives of ordinary, everyday, functioning? When do the interactions between narrative and non-narrative expert knowledge cause problems? How do expert narratives move from the contexts in which they are originally constructed to wider technical, legal and policy spaces? Speakers included: Chris Hall, Shana Vijayan, Hannah Roscoe, Andrea Mennicken, Natasha McCarthy, Mat Paskins, Lars Bo Henriksen, and Brendan Clarke. (Left to right): Ross Brooks, Dr Michael Toze, Ellie Armstrong, Dr Dominic Berry, and Andrew Sherwood. Accessibility: Easy wheelchair access directly from the street on Aldwych. Lecture hall is on the ground floor. A hearing loop will be in place. This is a public lecture and all are very welcome. Registration is not essential (you can bring people in at last minute) but to help with planning, if you are expecting to attend, please do register via the Eventbrite page. 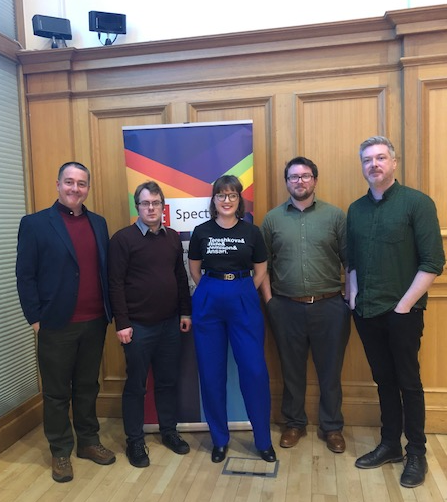 In what ways do our ideas about science, what it is, how it works, and who does it, need to change in recognition of LGBTQ+ lives? The history of science in public is still often told as male, white, able-bodied, and heterosexual. This does not reflect reality as evidenced by expanding historical and sociological scholarship, which in recent years has begun to incorporate insights from trans studies and queer theory, creating frameworks and findings that matter for the broadest histories of science, technology, and medicine. In recognition of these exciting and important developments, and with the aim of directly bringing them to broader audiences, this lunchtime lecture invites you to engage with scholars currently exploring and integrating these questions. To organise our thoughts, we also reflect in particular on the importance of narrative for the historical, philosophical, and sociological investigation of science. This angle builds on the expertise of the Narrative Science project, which aims to uncover narrative's importance and epistemic functions in the history and philosophy of science. Ellie Armstrong (she/her) is a PhD candidate at UCL looking at what a queer feminist critique can bring to understanding how science is displayed in science museums. She is the recent organiser of ‘Queering the Science Museum’ a tour series that explored how queer theory could be practiced in the museum. ​Dr. Michael Toze (he/him) is a Research Fellow in the School of Health and Social Care at the University of Lincoln. His research focuses upon ageing, health and LGBT experiences, and particularly the experiences of trans people. He is the author of ‘The Risky Womb and the Unthinkability of the Pregnant Man’, and ‘Developing a Critical Trans Gerontology’. The number of places is unfortunately limited, so please make sure to write to us sooner rather than later. The deadline for expression of interest is Friday 1st of March. We will notify those we are able to accommodate shortly thereafter. Update 5/3/2019: All PhD travel bursaries for this event have now been allocated. How and when does narrative play an epistemic role in scientific activity? 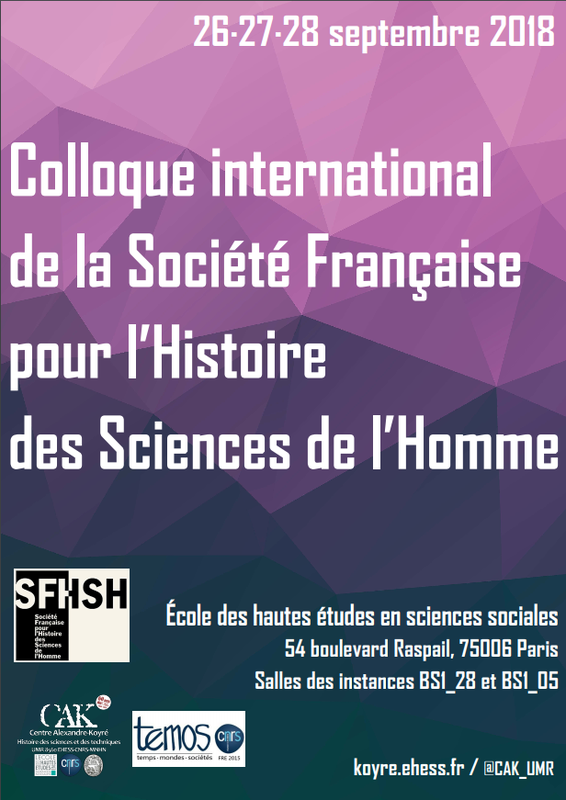 Scholars in French Studies are well placed to explore the contours of such “narrative knowing”—a topic of increasing interest to historians of the modern sciences. In this panel, we examined the epistemic function of narrative in the “psy” sciences of nineteenth-century France, specifically in instances when savants, physicians or novelists engaged in practises of rewriting. As psychological or psychiatric case histories spread—from patient to physician-observer, to philosophers or psychologists—and came to incorporate concepts from other scientific domains, their narrative form underwent various reconfigurations. The narrative focalisation might shift, for instance, between a focus on the patient’s experiences and one on symptoms. Similarly, cases could be inscribed in a range of generic forms: scientific observations, reports in medical periodicals, novels. Rather than considering these textual transformations purely as a matter of style, papers in this panel analysed their contribution to making sense of “psy” phenomena. What avenues of psychiatric enquiry were furthered or closed off as psychiatrists retranscribed their patients’ stories into publishable case histories? How did the choice and ordering of concrete details articulate with different ways of explaining the apparently doubled personality of Félida X? And what kinds of psychological and literary exploration follow from Proust’s reconfiguration of the physiological notion of “temps perdu” into his literary “case”? In mapping forms of narrative knowing in the long nineteenth century, our papers also ultimately highlighted the productive contribution of a “French Studies approach” to enquiry in the histories of science and medicine.